Auditor QC, Calibration Verification, Daily Quality Control | AUDIT MicroControls, Inc.
Free Auditor™ QC tool for data reduction of your calibration verification and daily quality control results. Access the tool at www.auditorqc.com and enter your raw data. Receive instant online analysis by analyte to print or store in our online database for future reference. 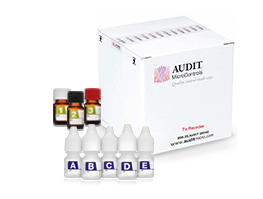 AUDIT® Quality control made easy. Enter your existing Auditor QC Username and Password. If you are not a current user, simply click on New User and proceed. Select the linearity or control product, lot number, analyzer, technician, date of run, and specific analyte with associated test results. Hover over the example reports below to magnify.